This special package includes everything you need in a go-to studio vocal mic. 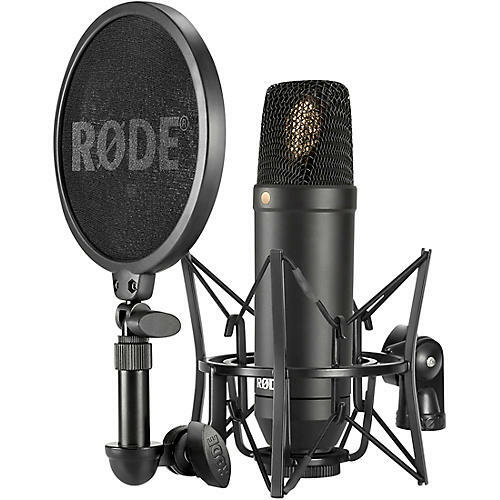 It includes the Rode NT1 microphone as well as a specially designed shockmount with built-in pop filter. The HF6 is the perfect example of R˜DE's state-of-the-art fusion of artistic design approaches and cutting-edge manufacturing techniques, with a sound signature reminiscent of the famous microphones of old, while at the same time exhibiting extremely low noise. The unique dual-Lyre suspension system of the SMR was developed by R˜DE's engineers to improve the overall effectiveness of the shock mount. The smaller inner Lyre acts as a tension element, to maintain each Lyre in its neutral position where it is most efficient at cancelling vibration. Dimensions: 7.36 x 1.96 x 1.96"